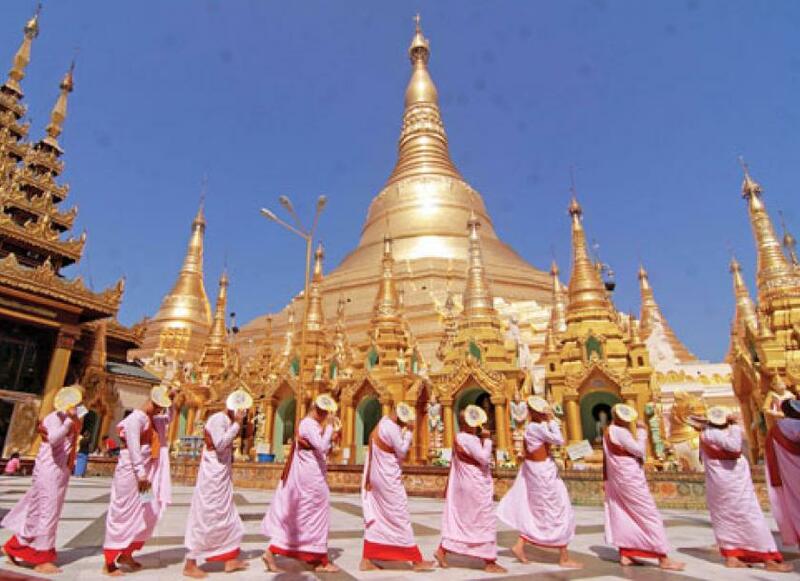 Our Yangon, Bago and Thanlyin Tour will take you to the holy land of Bago with wonderful Buddhist pagodas. Shwemawdaw Paya and many others names will satisfy your travelling desire and this is also a great chance for you to experience the history and architecture of Burmese. A real heaven of ancient temples is waiting for you, let fly and enjoy! dinner. Then transfer to hotel for check in. Overnight at hotel in Yangon. Bago - an ancient capital of Mon Kingdom founded in 13th century. Visit to Kyakhatwine Monastery which one may observe over 600 student monks having lunch under the way of Buddha’s guidance, ShweThar Lyaung Reclining Pagoda , 55 meter long and 16 meter high reclining Buddha Image, built in 994 AD and Shwemawdaw or 'Great Golden God Pagoda, the tallest of the Burmese pagodas. It has been growing for more than 1000 years. After lunch at Bago, continue to Golden Rock (Kyaikhtiyo), one of the most interesting tourist destinations famous for its mystical pagoda stands on the gold gilded boulder precariously stand on the edge of the cliff which is over 3000 feet above sea level at Mt. Kyaikhtiyo. Arrive to the base camp of the mountain, change to the local truck about 45 drive up the mountain. Overnight at hotel in Golden Rock. After breakfast, descend from Kyaikhtiyo Pagoda. Drive back to Yangon via Bago and sightseeing includes. “Kanbawzathardi Palace” the famous palace of King Bayinnaung (1551-1581 A.D.) is being extensively excavated and some buildings are being rebuilt and “Kyeik Pun Pagoda” built by King Dhamma Zedi in 1476 A.D, four gigantic Buddha images all in sitting posture facing the four cardinal points of the compass. Then drive back to Yangon. On the way, visit to Lawka Chanthar - world biggest marble Buddha ; and royal white elephant. At evening, visit to magnificent Shwedagon pagoda, the massive bell-shaped golden spire covered with 60 tons of gold plates .Enshrined with the Lord Buddha&#39;s eight hairs relic, built over 2500 years ago. It is also the most highlight and the holiest site in Myanmar. Overnight at hotel in Yangon. After breakfast drive to the colonial town of Thanlyin (former name Syriam). It was a major port and an important trading centre in the 17 th Century. 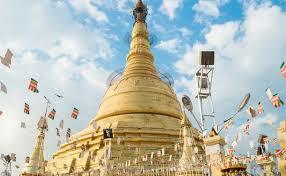 On the way, we will stop at the KyaikKauk Pagoda, one of the ancient pagodas, located on a hillock. Then, visit Yele Paya situated in mid-stream of the river which we need to travel by local boat and stroll out the Thanlyin local market along the river side where you can see the daily lifestyles of local people. On the way back, we will also explore the ruins of ancient Portuguese Church which is a place to know the archaeological era of 18 th century. After that, drive back to Yangon and start to visit city tour such as the heart of Yangon to see Independence Monument in Mahabandoola Park, City Hall, High Court and many colonial style buildings, Botahtaung Pagoda and Bogyoke Aung San Market (Scott Market) which can be said as a shopping paradise for tourists and you will see a variet of traditional handicraft, gemstone, art, food and clothes. At evening, transfer to Yangon international airport for departure. Hello Izbooking good tracking on the spot (htar ei) drivers nickels. lack hot water in the first hotel rangoon. super oiled transfers (better than in France) comfort of chosen hotels. kindness of the Burmese. The destination is a spectacular one, still very unspoiled and authentic. It is hard to mention a special attraction, as we enjoyed absolutely every moment of our trip. We are sure that we shall be back in Myanmar, with a larger group of friends, and with your agency . An eye-openning trip Meeting people and seeing many aspects of their 'everyday life'. Perhaps the biggest factor was having local guides. This enabled us to experience things that we would never have done on our own.